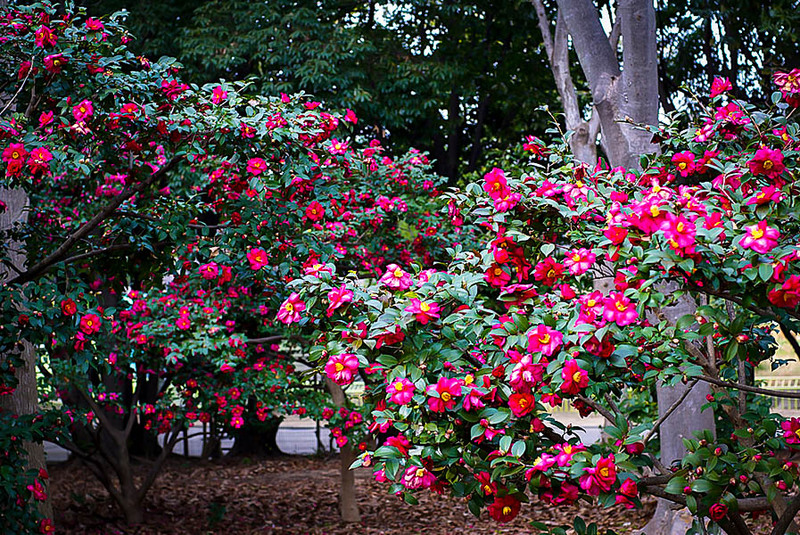 The Kanjiro Camellia is an authentic Japanese variety of these wonderful evergreen shrubs. It is fall blooming – just when most other plants have finished flowering, and at that time it is smothered in beautiful rose-pink blooms. Each bloom is a swirl of petals, and they nestle among the glossy foliage, making the perfect picture. When blooming is over the petals drop naturally to the ground, and the plant always looks neat and fresh. 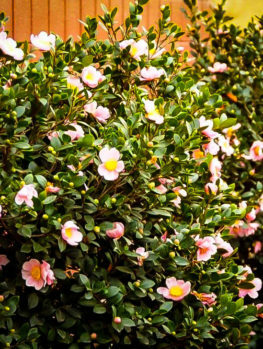 This medium-sized shrub is perfect to grow in semi-shaded locations in any garden. It makes a perfect specimen, fits among other shrubs in a mixed border, or grows in a woodland setting among Japanese maples, rhododendrons and azaleas. It is also an ideal container plant, looking lovely in or out of flower. It can even be used to make a spectacular screen or informal hedge, evergreen all year for privacy, and a marvelous display when flowering. 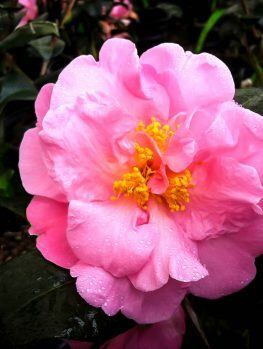 Plant the Kanjiro Camellia in a sunny or partially-shaded spot. It should have shelter from hot afternoon sun in warm areas and from early morning winter sun in cold places. Choose a spot sheltered from cold winds and in rich, acidic soil. If your soil is not acidic you can use chelated iron for plants in the ground, or plant in a container in lime-free compost. Mature plants are moderately resistant to mild drought, but always appreciate regular watering. There are no significant pests or diseases and these plants are easy to grow when planted in a suitable location. Camellias are perhaps the most beautiful of all the flowering shrubs for gardens. Everything about them, from their deep-green glossy leaves to their wonderful flowers, make them special. Depending on the variety, they can be in bloom from fall to spring, so with several you have blooms for months. 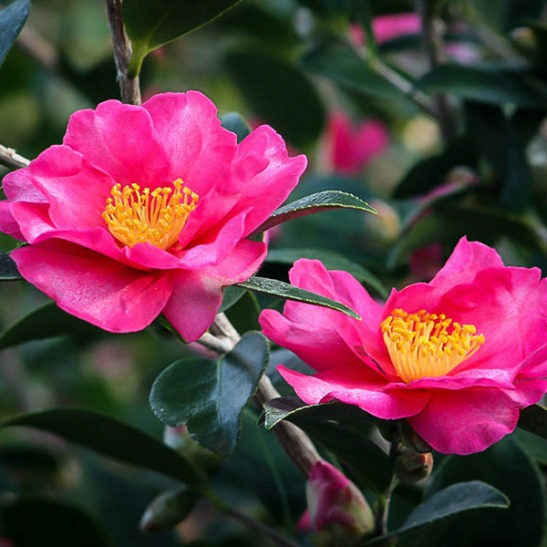 Because they are so special, it is no wonder there are hundreds of different varieties – all beautiful, but the Kanjiro Camellia stand out from the crowd. It grows into a medium sized evergreen shrub, eventually reaching 8 to 10 feet tall, and almost as much across. A mature bush in bloom is a spectacular sight, smothered in large, semi-double blooms that are rose-pink becoming darker red at the edges of the petals. Bright yellow stamens show in the center of the flower, nestling among the ruffled petals. The leaves are glossy green, with a finely-toothed margin, and the plant itself in slightly open in form, with branches that arch gracefully, but are not weeping. It blooms in fall, bringing fresh new flowers to the garden just as the summer is fading, and most other flowers have finished blooming. Blooming at that season makes it especially valuable, extending the gardening year and bringing color and interest just when it is needed. 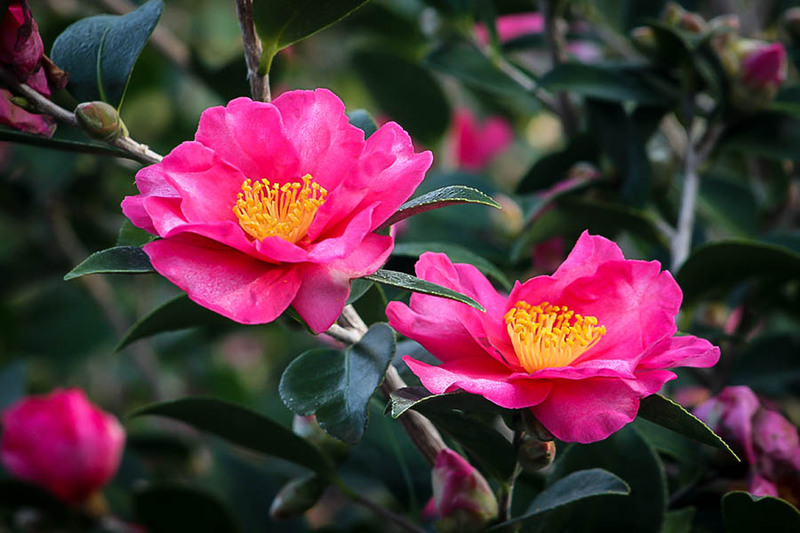 Use the Kanjiro Camellia as a background plant in beds, especially among Azaleas and Rhododendrons, or Japanese Maple Trees, which enjoy the same growing conditions. It looks beautiful in an informal or natural garden, mixing with other plants, but it also looks great in more formal settings, and it makes a lovely hedge or screen too. A line of plants beside a walkway, or against a wall, is spectacular, especially when the plants are blooming. Since it is evergreen, and the foliage is attractive, even when not flowering it is a great addition to any garden. 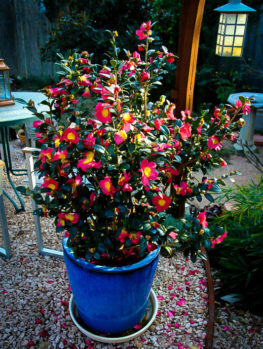 The open form makes this shrub blend with others plants in a way that other, denser camellias do not do. When the flowers fade, the petals fall to the ground, so you do not have dead flowers that need to be trimmed making the plant look untidy. It always looks fresh and beautiful. 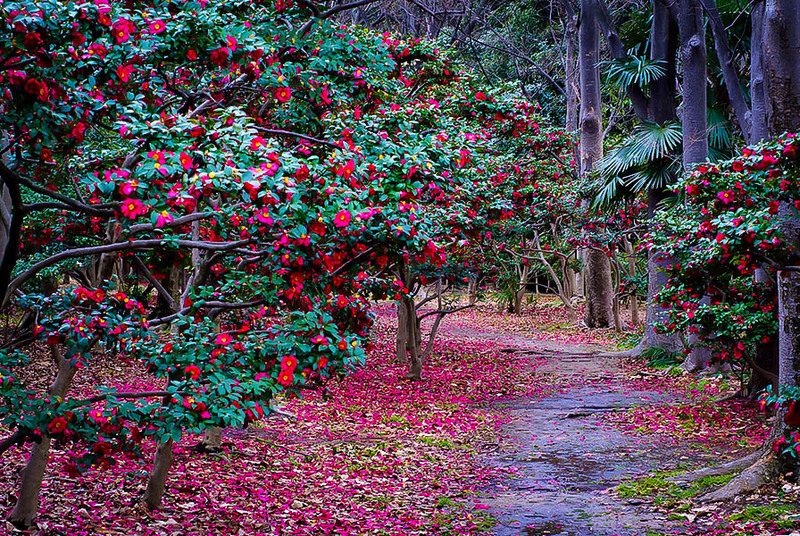 The Kanjiro Camellia will grow in sunnier places than the Japanese Camellia, and it will also grow in partial shade. Locations with morning sun and afternoon shade are best in warmer areas where the sun is very hot in summer. Shelter from the morning sun in winter is valuable in colder areas. It grows best in acidic soil, so if you are unsure, see if there are camellias growing in your neighborhood, or use a simple, low-priced kit from a garden center or hardware store. If you do not have acid soil, then use chelated iron supplements in spring and fall. Camellias also grow well in pots, and their beauty can be enjoyed anywhere in the garden by moving the pots around as you wish. Use a large pot with a drainage hole and always use potting soil for acid-loving plants. Use acid-plant fertilizer as directed on the packet, and water well whenever the top layer of the soil becomes dry. 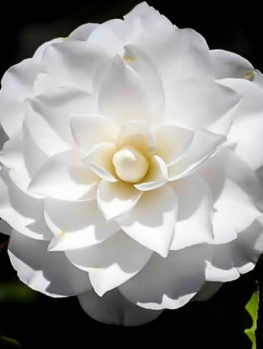 There are several species of camellia grown in gardens, as well as plants created by crossing two species together – hybrid plants. 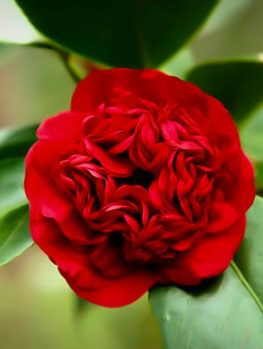 The Kanjiro Camellia is a hybrid plant developed from two species, Camellia sasanqua and Camellia japonica. 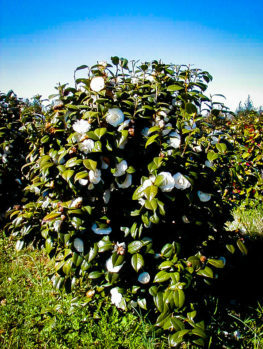 The resulting hybrid is called Camellia × hiemalis. The particular variety called ‘Kanjiro’ was bred in Japan by the firm, E. Takii & Co. who are a family plant-breeding nursery dating back to 1835. 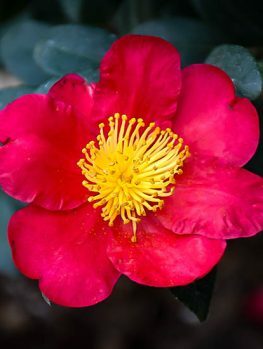 The Kanjiro Camellia was released in 1954, and it has stood the test of time to prove it great worth and value as a garden plant. For a garden in the Japanese style, this authentic Japanese variety is an ideal choice, but it is so beautiful that of course it will fit into any style of garden at all. If you have never grown camellias before, then this variety is a great place to start – you will be amazed at the beauty. 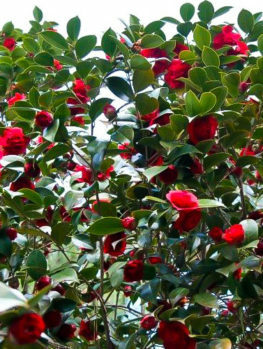 If you have, then this a wonderful variety to add to your collection – and if you have not grown fall-blooming camellias before, this is the chance to do that. Whatever the reason for your interest, our stocks are limited, as this variety is always in high demand, so order this top variety now and avoid disappointment. We invite you to check out other varieties that we have in stock, like the Professor Sargent Camellia and the White By The Gate Camellia.